The Southern European DNA enigma. Option 2. The DNA is Ancient. 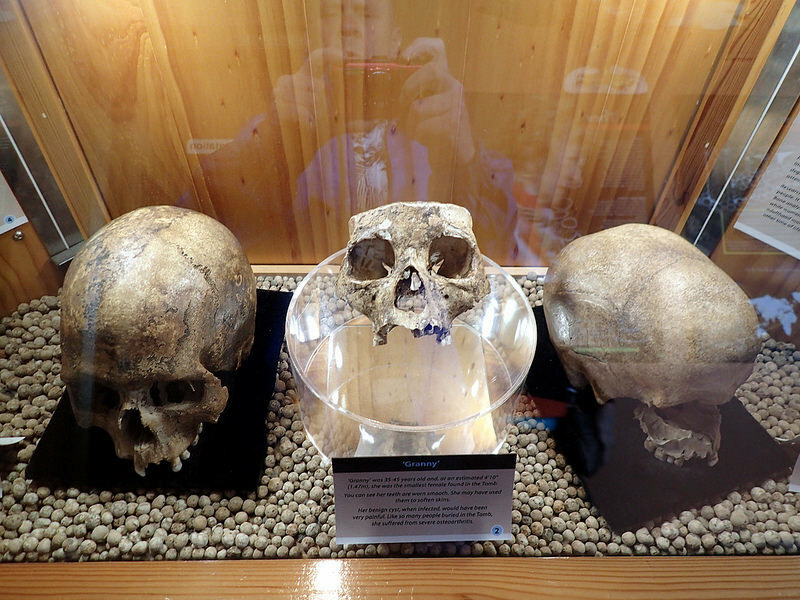 The above photograph taken by me, of Neolithic skulls from the Tomb of the Sea Eagles, Orkney. I'm not the only English person reporting "Southern European" on their Autosomal DNA for Ancestry test results. I've noticed that on 23andMe, for example, that English often report these strange low percentages of "Southern European" in their ancestry composition results. There may be something odd about the ancient ancestry of the English, that we do not yet know. Others have also pointed out that in ancient admixture calculators, that the English receive lower percentages of ﻿﻿ANE ﻿(Ancient North Eurasian) than do the Irish, Scottish, or other nearby neighbours. POBI (People of the British Isles 2015) suggested a unknown immigration into Southern Britain during Late Prehistory perhaps from the area that is now France. Some point to perhaps, more Neolithic survival in lowland Britain, relating perhaps to Sardinian patterns. Others suggest immigration from Southern Europe and elsewhere during 360 years of Roman occupation. Option 2 is a possibility - perhaps these is something about English ancestry that we do not yet know about, that confuses the algorithms of commercial DNA companies, when trying to identify our more recent ancestry. The above photo at A Capela dos Ossos (the bone chapel) in Évora, Portugal. 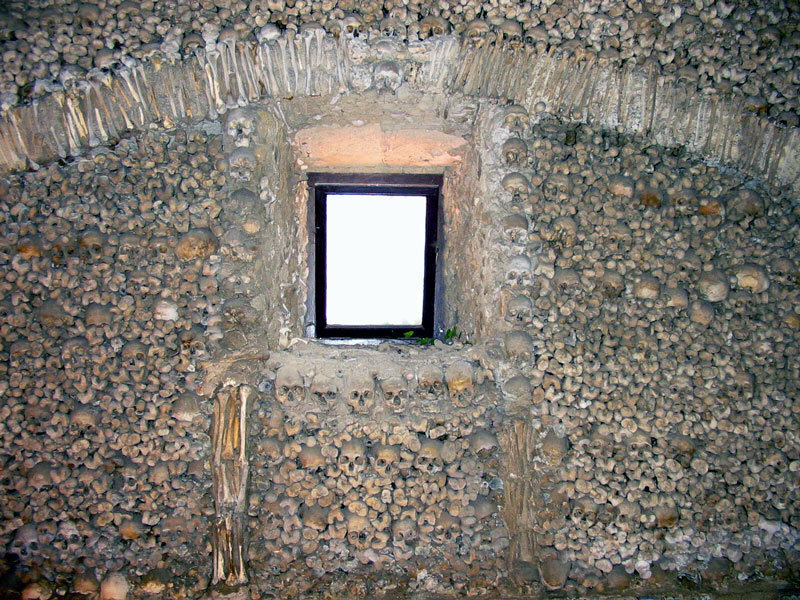 The entire chapel is covered with human bones. Every wall and pillar is decorated with skulls and bones. On another wall hangs the mummified remains of a man and child, said to have been cursed. There is a sign at the entrance of the chapel which states "Nós ossos que aqui estamos, pelos vossos esperamos" (Our bones here, await yours). I was a sceptic of genetic genealogy, I'll admit it. Now I'm hooked. Not because I feel that it has been a way of hooking up with distant cousins, that can help me extend my family tree. That's not the way that I've used it so far. Instead, it has provided very different kind of information, that helps me understand who I am, and how I can link my ancestry to known heritage. I might not have been so hooked, but I've had so many surprises with my 23andMe results. If my results had been perhaps, dire and boring, then maybe I would have retreated to traditional genealogy and regarded the technique as predictable and uninteresting. However, what ancestry related surprises did I have? I have a very rare Y haplogroup for NW Europe. So far predicted to L1b M317. It will be shared by my brother, my son, one cousin (and his son, and grandson). Today I sent away a further FTDNA Y111 swab test. The L haplogroup is mainly concentrated in Southern and Western Asia, from Afghanistan down to Southern India. My L1b M317 sub clade is concentrated in Western Asia, including Eastern Turkey, Armenia, Georgia, Azerbaijan, the South Caucasus, and Western Iran. A faint trace of it along the length of the Med in Southern Europe, and across Italy, and a slight cluster in central Europe - which apparently, I don't belong to. Autosome Ancestry composition by 23andMe, gave me a very low percentage of "British & Irish", and high percentages of "French & German" and "Scandinavian". I've explored the possibility that this could reflect early medieval admixture from across the North Sea. I've looked at the typical Ancestry Compositions of people with a strong recorded English ancestry, and compared them to the results from people with strong Irish ancestry. That SE English people typically sit somewhere between the Irish, and typical Dutch in Ancestry Composition reinforces my view that this is the case. My mtDNA was H6a1. Not the most exciting haplogroup, but not the most boring neither. It allows me to relate to the latest evidences for Eurasian Steppe admixture into Western Europe during the Early Bronze Age. 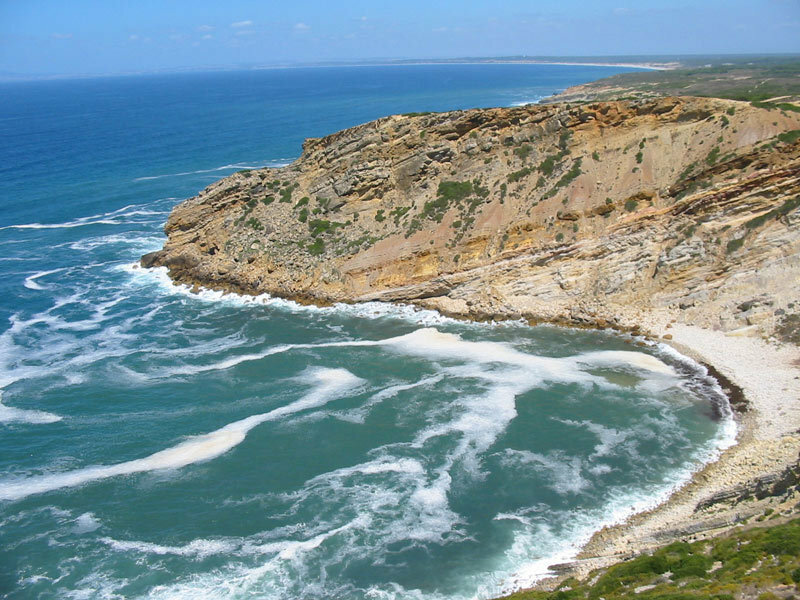 I captured the above photo at Cabo Espichel, Portugal. There was a fourth, further surprise in my 23andme results. It lay in the autosome. 23andMe AC (Ancestry Composition) on speculative mode, suggested 2.4% Southern Europe, including a prediction of 0.5% Iberian ancestry. On speculative mode again, it falls on five pairs of chromosomes - but never on both sides. On standard mode, 0.1% remains, just on one side of pair 21. This suggests that all of it comes from just one of my parents. I might think that this was just "background noise", an error in AC. However, it keeps popping up. Indeed when I upload my raw data to the program at DNA.land, they predict only 80% North/Central European, and a whopping 15% South European. It doesn't stop there. On GEDMATCH, the Eurogene calculators keep suggesting Iberian or South European admixture on their mixed population oracles. Eurogenes K9 for example, gives me 61% North European, 29% Mediterranean, and 6% Caucasus. Let's just refer back to my recorded paper ancestry. I have 190 recorded ancestors, all in England, with English surnames. No sign of any Roman Catholicism. I have all sixteen of Generation 6 (G.G grandparents) named. All born and named English. No sign of any South European even in the 1,490 people on the entire family tree for my kids. However, I think that all of the autosome ancestry calculators could be telling me a truth, that I can't see in my known family tree. If I have a South European ancestor somewhere, whether Iberian or not, then either a) I have not yet found them, or b) they were the biological ancestor of a NPE (non-parental event), a cuckoo. I have 3 out of my 32 Generation 7 ancestors unnamed - all absent fathers. I have 15 missing ancestors in Generation 8. Above that, the representation really starts to decline, although I have some ancestors named up to Generation 11. Could a South European be in there? 23andMe in speculative mode suggested 2.4%. That would seem "average" for an ancestor in Generations 7 or 8 (3 to 4 x G grandparent level) Of course from around that point, "averages" become pointless, and subject to a randomness that can delete entire lineages further up from any surviving DNA. None-the-less, I could have a South European from around that period - either one of the 18 "missing" ancestors, or a NPE cuckoo. I'm commissioning a 23andme test for my mother. Three reasons. 1) she wont be here for ever. Recording her genome feels valuable and worthy. 2) I want to see how her very dense 100% recorded Norfolk ancestry projects on Ancestry Composition and on GEDMATCH. 3) I want to phase her results against mine. It will tell me for example, where my "South European" DNA came from - which parent. It will help me further understand my own genetic ancestry.